With four minutes remaining, the Ducks were down 54-53 to Alabama and Oregon’s 30-game home streak was on the brink of being erased. Thankfully for Oregon and its fans, that streak continues as the Ducks made all the plays down the stretch for a 65-56 win over the Crimson Tide. The contest was tied at 56 with 1:50 left when Dylan Ennis hit a three-pointer from the right corner as the shot clock was winding down to zero to give Oregon a slim lead. After they got a defensive stop, Oregon found its other Dillon, as in Brooks, for a long jumper for two to give the Ducks a 61-56 lead with 48 seconds left. That was too much for the Tide. Tyler Dorsey led the Ducks with 19 points on 5-of-8 from long range with Chris Boucher and Brooks each adding 10. It was stark contrast from the last time Oregon played as the opponent, Savannah State, played little to no defense. Alabama came to play with a hard-nosed defensive effort one would expect out of an SEC team. The Tide held the Ducks to 52 field goal attempts and 44 percent shooting. Donta Hall led Alabama with 14 points and Ar’Mond Davis added 10. In a rare occurrence, the winner of the game was outrebounded with the Tide holding a 33-27 advantage on the boards. The most exciting moment of the first half might have been when Oregon’s new head football coach Willie Taggart was introduced to the Matthew Knight Arena crowd. Both teams played tough defense and made it difficult to get any offensive rhythm going. But despite making just 37 percent of their shots, the Ducks went into the halftime locker room with a 31-23 lead over the Crimson Tide. Alabama scored the first five points of the game and that woke Oregon up. The Ducks rolled off a 23-4 run to grab their biggest lead of the half at 23-9. 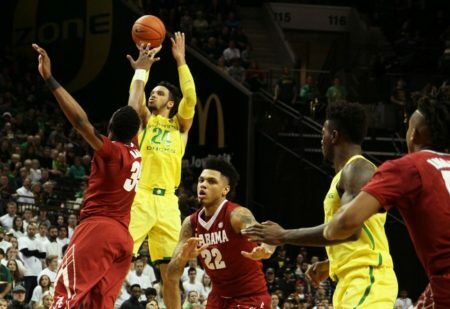 Eight players scored for Oregon in the first 20 minutes and they were on the verge of a blowout until the Crimson Tide ended the first 20 minutes on a 7-1 run of their own. Oregon will get back at it on Tuesday when the Ducks host Montana. The Grizzlies are struggling with a 3-7 record and are still looking for that first road win. They’ll be coming off an 85-83 loss at Wyoming. The Ducks and Griz are scheduled for a 7 pm tip on the Pac-12 Network.